Originally featured in The Guardian on Saturday 17th November. Written by Alys Fowler. If you examine my pockets you will always find, among the lint, some seed. It’s an absent-minded ritual when I see ripe seed. I guess it makes me feel safe to walk around with a potential garden in my pockets. 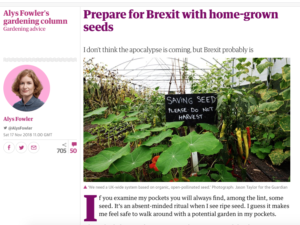 I don’t think the apocalypse is coming, but Brexit is, and the climate is changing. We need seed that can cope with these things, seed that can adapt to our soils and our climate. Most of our seed is produced in places with drier climates and cheaper labour. We need a UK-wide system based on organic, open-pollinated seed. Open-pollinated seed breeds true, meaning that, after pollination by natural means – either an insect, bird, wind or human hands – with another representative of the same variety or by self-pollination, the offspring will be roughly identical to its parents. The “roughly” bit matters because this seed is not uniform. It closely resembles its parents, has their characteristics, but it also has its own genetic diversity, and that means adaptability and resilience to changing conditions. The variations may be subtle (perhaps it ripens a bit earlier), or it may wears its diversity like a badge (a multicoloured cob of corn, say). The Food And Agriculture Organisation estimates that vegetable crops worldwide have lost 75% of their genetic diversity in the past 100 years. On top of that there’s been an increase in patented and genetically modified seed, owned or controlled by a handful of companies. You can’t do this to open-pollinated seed: a grower can buy seed, save their own and continue to do so for as long as they care. This is called seed sovereignty and there’s a growing worldwide movement to create more of it. It aims to reclaim biodiverse seed, to give growers the right to breed and exchange diverse, open-pollinated seed that can be saved by anyone. The Gaia Foundation set up the seed sovereignty programme in the UK and Ireland to support and develop an ecologically sustainable seed system. Real Seeds in Wales has been leading the way for years, but there’s an increasing band of independent suppliers of vegetable, herb and flower seeds including the Seed Co-Operative in Spalding and Vital Seeds in Devon. The programme aims to support such seed producers and create more, training small-scale growers, market gardeners, farmers and home growers to conserve threatened seeds and breed new varieties for future resilience. Seed Week starts on 3 December and urges anyone who grows to buy their seed from UK organic or open-pollinated seed producers.